A fitting end for the Gears' finale? It's loud, it's brash, it's corny, and it's typically American. Yet there's no denying that the Gears of War franchise has consistently entertained with its blend of hard-hitting action, impressive bestiary and stock of crazy weapons, including the now-infamous chainsaw bayonet. With an emphasis on cover-based combat, frenetic battles and strategic co-op play, Gears of War 3 represents the pinnacle of the series; and boy has it gone out with an almighty bang. Five years of refinement since the first game has given developer, Epic Games, the tools to deliver a sci-fi drama that is up there with the best - a package that combines sumptuous HD visuals and belting audio with thrilling gameplay, meaty combat and intense battles. 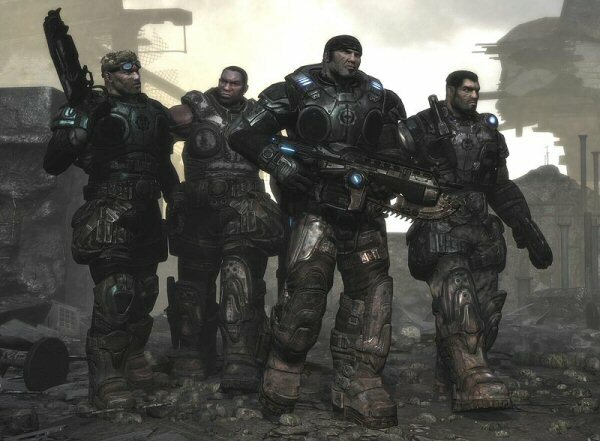 Marcus Fenix is back with his COG force on a mission to rid the planet of infected Lambent (locust mutations) that emerge from underground. Despite the rugged lead character's manly quips between his buddies - and the fact that he'd rather kick down a door than open it properly - it's refreshing to see his tender side as he searches for his father and heads ever closer to an emotional finale. Okay, so this isn't an award-winning narrative by any means, but it's testament to the quality of the cut-scenes and the humour and likeability of Fenix and his pals, that not once did we feel the need to skip a sequence and just get on with the action. In truth though, these scripted moments prove to be the ideal time to rest your aching fingers, take a much-needed breath and soak in some of the dramatic moments you've just witnessed.